The individual soldier remains the most valuable asset of the military, and in spite of the current emphasis on the threat of weapons of mass destruction (WMD) and biological warfare (BW), attending to the soldier's needs when they become a casualty remains a top priority. Very little has changed in terms of the needs of the wounded soldier at the far-forward battlefield, especially during the "golden hour''. What has changed is the technology to significantly bring immediate care to the casualty. There is a significant opportunity to save the lives of soldiers by using forward deployed telesurgical capabilities to control the consequences of abdominal vascular injury. 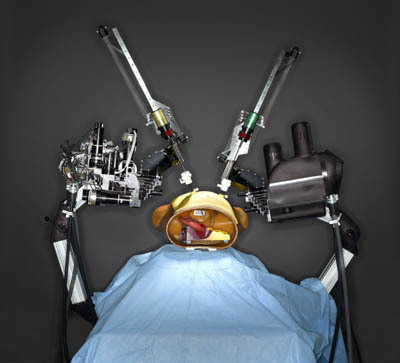 The surgical robots resulting from DARPA research now being deployed and FDA approved are very exciting developments, but share significant limitations: bulky envelope, lack of haptic (force) feedback, and high costs. In selecting the appropriate mechanism for a surgical robot we must incorporate knowledge of the surgical task, the surgical environment, tool kinematics and dynamics, and properties of actuators, transmissions, and structural elements. We believe the design approach of todays surgical robots, and their consequent size and weight, prevent the effective deployment for military needs and that a new class of surgical robotic mechanisms can be developed which will be dramatically smaller than existing designs. We will test this hypothesis by developing design theory, and prototype designs, and quantitatively evaluate them against an extensive database of force and displacement measurements in surgery. 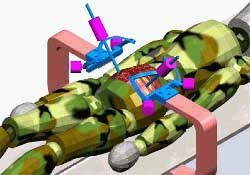 (1) Measure all relevant forces and displacements in actual surgery in experimental animals in procedures, sub-procedures, and skills most relevant to abdominal vascular trauma in combat casualty care. (2) Study candidate mechanisms, and develop computerized design tools which translate quantitative surgical requirements into mechanism parameters. (3) Design and prototype a new, dual arm teleoperated surgical manipulator, supporting the motions and forces/torques obtained in objective 1, using the methods of objective 2. The four-year project included four parallel tasks aimed at the objectives above. Mechanism design was closely based on measurements of the physics of actual surgery. 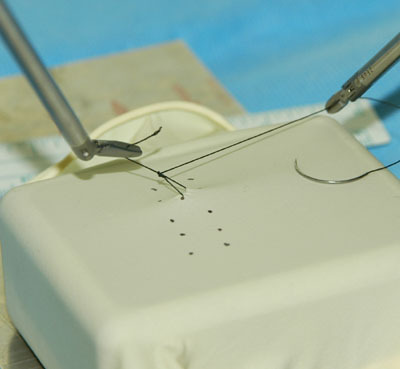 Performance of the prototype was evaluated in experiments and animal surgeries covering atraumatic control of vessels, cautery, tissue welding, suturing, and repair of vessel injuries to include: side cut vessel, clean cut vessel, ragged, torn vessel, ragged torn vessel with gap between ends. 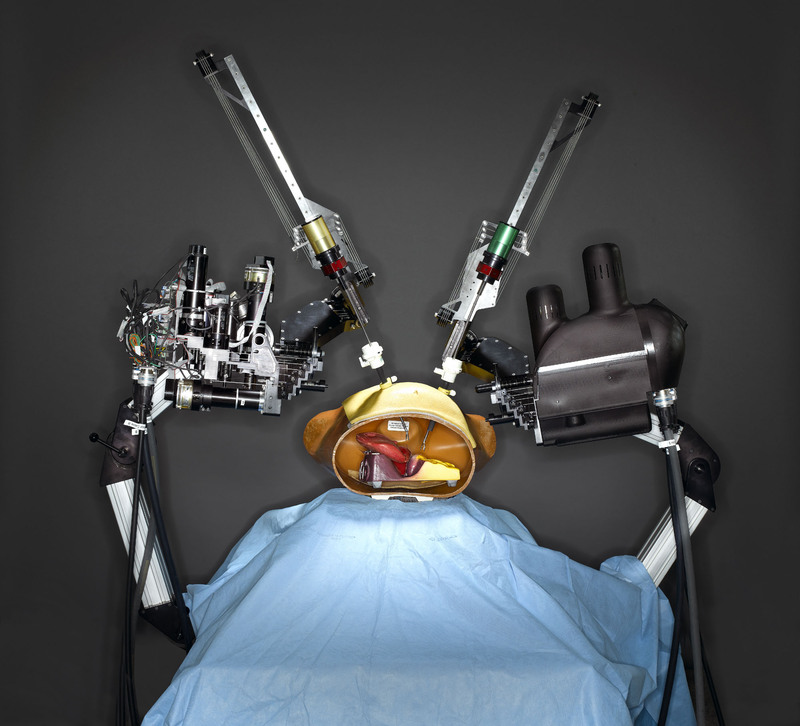 The past 10 years have seen the concept of robot assisted surgery go from advanced DARPA-funded prototypes to FDA approved commercial technology. However, the DOD's original vision of forward-deployed combat casualty care is still not possible. 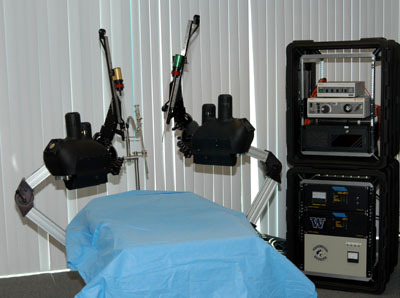 Today's commercial and research surgical robots are much too large to be deployed inside a vehicle. Our proposed design methods will dramatically reduce the military disadvantages of existing commercial and research surgical robots through two novel aspects. 1) mechanical design requirements would be derived from our quantitative measurements of actual surgery so that no excess capability will be designed into the system. and 2) we will move the actuation point closer to the surgical site --- dramatically reducing the volume and weight while smoothing and speeding up the motion response. These improvements will allow a surgical robot to be used to save lives in the cramped space of a forward deployed armored personnel carrier for the first time. Raven as a surgical robotic platform was subject of an extensive effort of deploying it in extreme environments and teleoperate it form large distance while utilizing wired and wireless communication channels. (*) Note: Most of the Bionics Lab publications are available on-line in a PDF format. You may used the publication's reference number as a link to the individual manuscript.